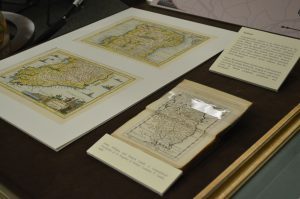 Whether you’re left-side brained or right-side brained, the cartographic treasures from the John F. Smith III and Susan B. Smith Antique Map Collections on display now on the first floor of Falvey are worth your while. 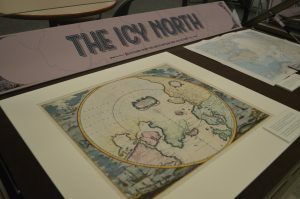 You can take a trip to the unexplored regions of the “Icy North” and search for the elusive northwest passage. You can ponder the balance of the world with Aristotle and the “Unmapped Southern Continent.” The latter of these adventures will leave you with some interesting knowledge: people speculated about the existence of Antarctica from as early as the 4th century. 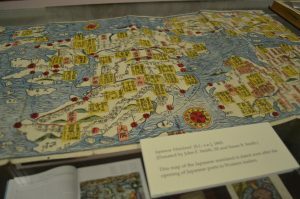 Other fun maps include the Curious Cartography display, where you’ll find a precursor to the modern jigsaw puzzle! A two-part map of Ireland. If history and aesthetics are more your thing, be sure to visit the Ireland, Japan, and Age of Exploration displays. You can admire the detail of a map produced shortly after Japan began trading with the West. You can see where Capt. James Cook’s adventures took him before a tragic mistake in Hawaii, or you can see a very detailed map of Ireland’s westernmost county, Connaught. Japan, as viewed only shortly after admitting foreign traders. This amount of travel hasn’t been possible in first floor Falvey since our “Around the World” display! My wife and I are really pleased at the innovative ways that the Falvey Memorial Library’s is making use of the map collection we donated.